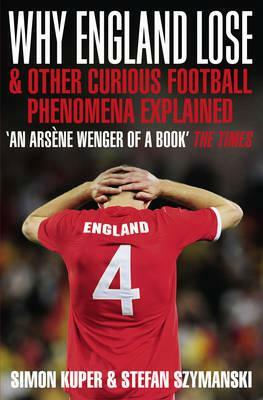 At last, football has its answer to Freakonomics, The Tipping Point and The Undercover Economist. "Why do England lose?" "Why do Newcastle United always buy the wrong players?" "How could Nottingham Forest go from winning the European Cup to the depths of League One?" "Penalties - what are they good for?" These are questions every football fan has asked. Why England Lose answers them. It brings the techniques of bestselling books such as Freakonomics and The Undercover Economist to bear on our national sport. Written with an economist's brain and a football writer's skill, it applies high-powered analytical tools to everyday football topics. Why England Lose isn't in the first place about money. It's about looking at data in new ways. It's about revealing counterintuitive truths about football. It explains all manner of things about the game which newspapers just can't see. It all adds up to a new way of looking at football, beyond cliches about "The Magic of the FA Cup", "England's Shock Defeat" and "Newcastle's New South American Star". No training in economics is needed to read Why England Lose. But the reader will come out of it with a better understanding not just of football, but of how economists think and what they know.